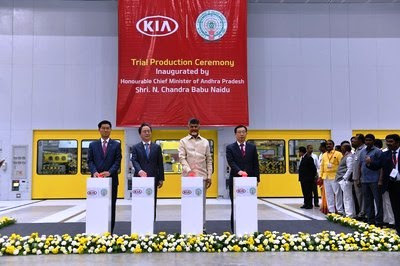 Kia Motors, the world's eighth largest automaker, today commenced trial production at its state-of-the-art manufacturing facility in Anantapur, in the state of Andhra Pradesh. This important step not only signifies the completed construction of the new 536-acre manufacturing facility, but also marks the arrival of Kia's new flagship car for India, the Kia SP2i - an exciting new SUV based on the Kia SP Concept, first showcased at India's Auto Expo 2018. The Kia SP2i will bring Kia's exacting standards for quality to the Indian market, as well as the brand's reputation for cool, modern design and cutting-edge in-car technology. Trial production of the SP2i will enable Kia to synchronize and fine-tune the brand's manufacturing equipment and technologies before series production commences later in 2019. Kia also consolidated its Future Mobility Partnership with the government of Andhra Pradesh by handing over an example of the new Kia Soul EV (electric vehicle). The new EV is part of Kia's growing portfolio of advanced, eco-friendly powertrains. This partnership reinforces Kia's commitment to supporting the Andhra Pradesh government in promoting the uptake of EVs and developing a local EV charging infrastructure. Kia's new Anantapur manufacturing facility occupies 536 acres and is capable of an annual production capacity of up to 300,000 units, boosting Kia's global manufacturing capability. The plant is poised to create more than 3,000 direct and 7,000 indirect jobs across the Andhra Pradesh region. A US$2bn investment by Kia and its vendor partners ensures the availability of world-standard technologies and the development of high-quality local manufacturing skills. An integrated automotive production facility, the new Anantapur plant employs the latest production technologies, with more than 300 robots automating the press, body and paint shops. In addition to world-class production competencies, the plant is equipped with high-end robotics and artificial intelligence (AI) technologies. Kia Motors is committed to meeting the socio-economic and ecological needs of humanity, and the plant uses environmentally-conscious techniques, such as 100% water recycling, to fulfil the company's responsibilities for developing sustainable and mutually-beneficial production practices. Since 2003, Kia's commitment to reducing the environmental impact of vehicle production has seen a 30% decrease in per-unit consumption of water resources globally. Kia Motors also seeks to maintain high air quality around its plants, with the company achieving a 44% per-unit reduction in local atmospheric pollutants since 2003. Each of Kia's manufacturing plants has installed independent systems to monitor the use of potentially hazardous chemicals on a regular basis. These high global benchmarks that Kia Motors has established at manufacturing facilities around the world have been brought to the Anantapur plant, making it Kia's most modern and energy-efficient production facility. Kia's global manufacturing leadership is focused on creating eco-friendly cars, raising the efficiency of production and recycling processes. While applying Internet-of-Things technologies to its products, the company also cooperates with its partners to expand the level and scope of production improvements, developing products and processes that are truly futureproof.